What are the Major Benefits of Invisalign? Are you currently walking around with a missing tooth that’s making it uncomfortable to smile, talk or eat? 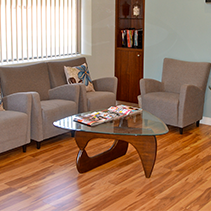 If so, one of the restorative cosmetic procedures we offer at Palm View Dental are dental implants. Today’s innovative implant materials allow Dr. Karen Ho to restore your smile like-new again promptly, reliably and affordably in the comfort of our office. One of the more common Invisalign questions that we get from San Gabriel Valley patients at Palm View Dental in Alhambra, CA, is how long it takes to straighten their teeth. Our licensed cosmetic dentists, Dr. Karen Ho and Dr. Min Hee Oh, will tell you that it depends on the level of teeth misalignment that you start with, and the amount of correction that’s needed. They can give you a better idea of how long it will take to restore your smile back to its natural, beautiful state with Invisalign therapy during an initial consultation. 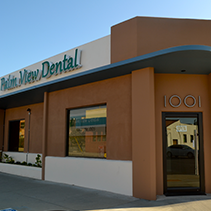 To schedule one today, call Palm View Dental at: (626) 345-7474! Why Should I Choose Invisalign Over Fixed Braces? We’ve all seen high school yearbook pictures of students with metal braces, and heard terms like “metal mouth”, or “tinsel teeth”. With the advanced bite correction methods that we use at Palm View Dental in Alhambra, CA, for most patients “metal mouths” are a thing of the past. Our licensed cosmetic dentists, Dr. Karen Ho and Dr. Min Hee Oh, are highly-trained in the latest smile-restoring products including Invisalign. 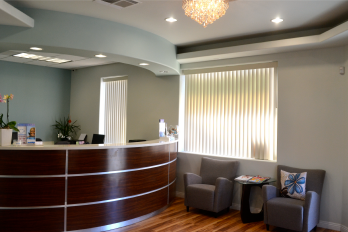 To discover why more San Gabriel Valley patients are choosing Invisalign to restore their smiles to the beautiful, natural states they were meant to be, ask the dentist during your next office visit, or call us today at (626) 345-7474! 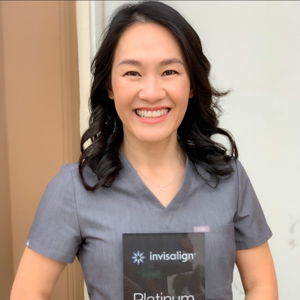 In the greater San Gabriel Valley area, Invisalign can only be used by dentists or orthodontists that are certified, like Dr. Ho and Dr. Oh at Palm View Dental in Alhambra, CA. Patients ask us about the cost of an Invisalign correction, so we tell them it’s about the same as a course of traditional braces, or roughly $3500 to $8500. The true value to the patient, in addition to their amazing smile, is how comfortable, discrete, and convenient the removable clear aligners are. Your smile is one of your greatest assets. This is why it is so important to make sure you are not only brushing and flossing your teeth but have a dental team that will provide you the best possible care. Sometimes it is confusing trying to figure out what kind of dentist you need. For instance, should you see an orthodontist or cosmetic dentist help you? Cosmetic Dentistry: Is It Really Safe? A lot of people are interested in getting cosmetic dentistry done, but they often wonder if it's actually safe? The truth is it really depends, but you can find out more by reading the rest of this article. It will discuss when it's safe, the potential risks of cosmetic dentistry and what considerations you need to take in before deciding to have a procedure done. Now…. why would you want Invisalign? Invisalign is an orthodontic product that can straighten your teeth and align them to improve function, reduce wear, reduce chipping, alleviate jaw pain, and allow access to previously crowded areas therefore improving your overall hygiene. This will all add to increasing the longevity of your teeth. These are just the tip of the iceberg benefits of straight teeth. A great demonstration of the benefits of straight teeth can be seen on this Invisalign video. 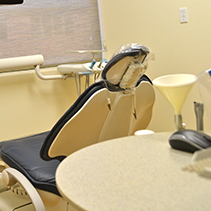 We believe with routine maintenance and proactive care, dentures will be a thing of the past. The Parts of Your Tooth and How They Affect Tooth Sensitivity. Do your pearly whites experience pain when you eat or drink something that is hot, cold, or sweet? Tooth sensitivity is the sharp burst of pain your teeth feel if you have tooth sensitivity and they touch something hot, cold, or sweet. This is likely from exposed dentin, that layer of the tooth below the tooth enamel that is filled with microscopic tubules containing nerve endings. 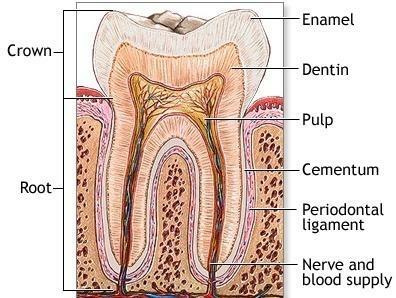 Dentin is usually protected by enamel in the crown of the tooth and by cementum in the root. So What Is in That Tooth?